The sky darkens, light rain begins to fall as the wind picks up, and then a tornado siren starts it's familiar wail. Is this the real thing? Is the storm headed in your direction? Or is it just another false alarm ? You flip on the local news and your trusted meteorologist is going "wall-to-wall" - but talking about a storm in another part of the viewing area. Or perhaps you are out at the park, or enjoying a ballgame, and don't have access TV or radio. How will you know if you really SHOULD take cover? Enter StormWatch+ mobile weather alerting from Cirrus Weather Solutions. StormWatch+ Alerts is a unique, personalized service that puts the meteorologist in the palm of your hand by sending alerts to your smartphone or tablet whenever severe weather threatens your specific location. Combining storm-based ("polygon") warnings issued by the National Weather Service and a user's precise location, alerts are sent only if the user's registered location is directly threatened. StormWatch+ Alerts keeps you from becoming "siren-weary" and "overwarned" by only alerting you if you are in the path of the storm. If sirens or your NOAA Weather Radio sound the alarm, but you do NOT receive a StormWatch+ alert, you are NOT in the NWS-warned area. * Though you should continue to pay close attention to a local weather source, the warning issued by the National Weather Service does not directly impact your location. This is what we call "peace of mind" and you can have it for less than the cost of a meal at your favorite fast casual restaurant! Where can I get StormWatch+ Alerts? 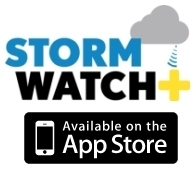 StormWatch+ Alerts is available in the StormWatch+ app on iTunes or the App Store for nationwide use. It is also available in the MemphisWeather.net mobile app for Android and iOS devices. Links to the apps can be found on this page. * Delivery of weather alerts via push notification is not guaranteed and is subject to many variables, including network infrastructure, available cell signal, etc, Never base important decisions on this or any other weather information obtained from the Internet. In matters of life-and-death, multiple sources of information is strongly advised. All users of this service are bound by the Terms and Conditions of Use.